Cherry Blossoms at Uedajo at Night. Ueda is a city in Nagano, Japan known for its deep samurai history and folklore. Although you may encounter a few festivals honoring its heritage, the city holds other various charms and pleasures that maintain a small-town, low-key feel that massages the senses. Below are the top 7 wonders of Ueda. With the outgoing winter and incoming spring, Ueda Castle (picture above) begins to bloom in April. On the weekends, you'll see tarps covering the castle grounds and many family and friends drinking and eating while unwinding under the white blossoms. Yatai (food stalls) are set up around the grounds, and many sample seasonal delights from takoyaki (octopus balls) and choco-banana (chocolate-covered banana with sprinkles). It's a relaxing and serene time for everyone as you'll see a hodgepodge of people: senior citizens strolling, teenagers in love, pet owners with one hand on a leash, company co-workers, and even gangsters. It's definitely a Japanese live version of Seurat's A Sunday Afternoon. And for a country that has a word for "death from overwork" (karoshi), a weekend enjoyment of good food, refreshments, and friends is therapeutical and philosophical. Because the blossoms come and go suddenly--like most of life. The Fried Shrimp & Pork Tonkatsu Dish at Rikitei. The history of tonkatsu is long, varied, and a wonderful read. To simply say, "Tonkatsu is fried pork cutlet" is like saying Apple is just a computer company or Disney a big theme park. While tonkatsu restaurants are ubiquitous in Japan, every city seems to have that one tonkatsu that is worth the wait. Rikitei is that tonkatsu shop in Ueda. It's right near the train station and is mom-and-pop owned. The mama-san (matron owner and server) has that grandmotherly charm and smile that will warm any heart. The tonkatsu is prepared by her husband and her son. 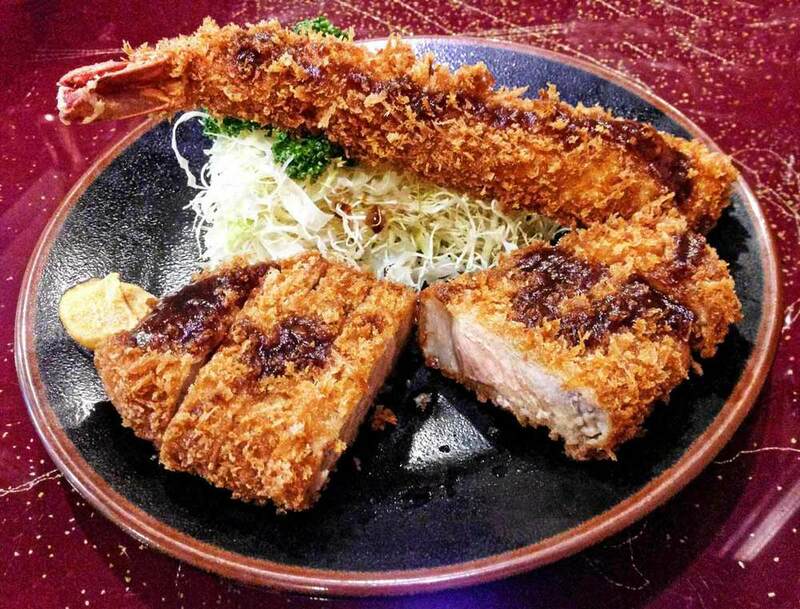 Despite being deep fried, the pork cutlet is crunchy without being greasy. It's accompanied with a serving of rice, cabbage, miso soup, and some home-grown vegetables. Go for the food and the atmosphere. It'll be a gem experience. Rainy season in Ueda starts around the summer time. During that period, you'll see the countless rice fields tended to for the season's potential harvest. As the rain comes, the fields are flooded and out come the tadpoles, frogs, dragonflies, and whatever aquatic life exists in those paddies during the summer months. Clouds spilling over the mountains in Ueda. It's the kind of underrated scene or subtle natural mysticism you'd find in a Hayao Miyazaki movie. The best parts happen in the morning or late afternoon as you'll find clouds literally spilling over the mountains. While most big city folks have to take an extended trip to do a little hiking. For residents in Ueda, it's either a train stop away or twenty-minute car ride. Summer-time hiking is the typical enjoyable sweat-fest. The town next over in Sakaki or even a quick trip to Sanada or Shioda offers a nice leisurely-paced hike. But without a doubt, autumn hiking offers the colors and cool temperatures. Photographers and videophiles will certainly rejoice. Ueda is home to the very famous Bessho-Onsen. Onsen is a unique trademark to Japan and the supposed healing properties are often retold from one visitor to the next. Whether true or not, there's nothing comparable than a winter dip in a hot spring. The contrast of freezing temperatures (sometimes even snow) and hot natural spring water has few comparisons. Other than alcohol, it's the Japanese way of "chilling." Although there are certain reservations about getting naked in front of a group of men or women, one relaxing submersion into an onsen and all worries just melt away. And as an added bonus, the nap after an onsen is a wordless pleasure. Narcisuss flowers in full bloom in Ueda. While technically in Ueda, it's actually located closer to one train station over in Oya. Besides being a musical hall that provides concerts from highly talent artists, Ongaku Mura also provides a wonderful bloom of narcissus flowers in April (picture above) and lavender flowers in July. The best-kept secret is a small bakery/cafe near the fields that offers some of the best bread in town, a soft and chewy loaf made with rice flour. 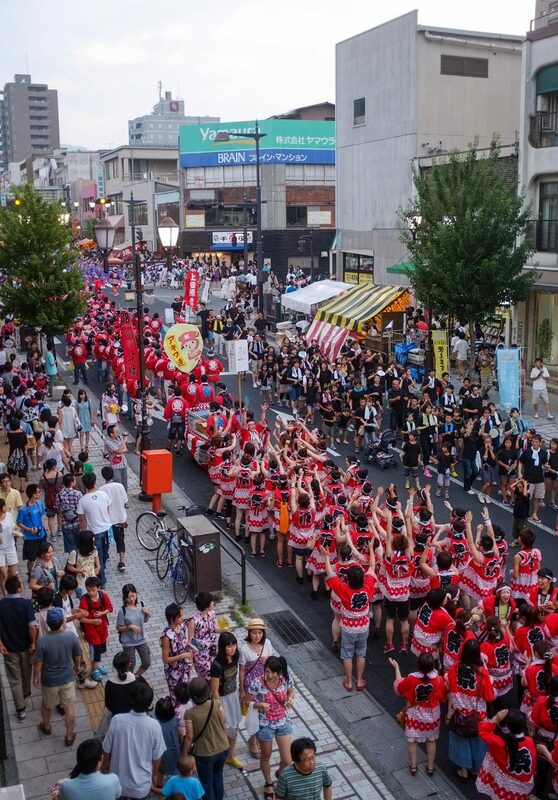 In August, Ueda holds a city-wide festival called Ueda Wasshoi. Each district within the city represents their home turf. Even companies in Ueda showcase their workplace pride. Food stalls are out in full force and music blares within the city limits as merry Uedians dance and yell the night away. While many citizens are on the ground floor of the festivities, being on the second floor or rooftop of a building offers the best views. Especially if you're in a bar or restaurant, where eating and drinking and people-watching are a celebration of all ages, shapes, and styles. Want a free tour of Ueda with an English-speaking guide? Get in contact with EGG (English Guide Group). Local volunteers who wish to share their love of Ueda.